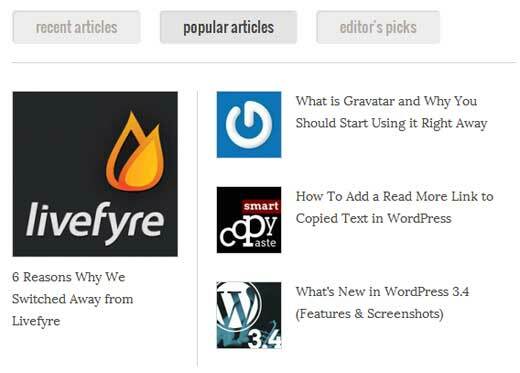 In the past we have shown you how to create a popular post tabber in WordPress using a plugin. That plugin works great out the box for tabbers. However, we wanted more customization in our layout, so we decided to do it without a plugin. 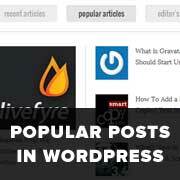 In this article, we will show you how to track and display popular posts by views in WordPress without using any plugins. To add other WP_Query parameters such as time range, refer to the WP_Query page on Codex. We hope that you enjoyed this post. That is basically what I want to do…have buttons at the top of my posts page for recent, popular/trending, editors picks. I haven’t found any plugins that can do that. The all focus on side bar widgets. It looks like your article is starting to talk about this but where to go from there is beyond my current knowledge level. This was very helpful.!!! Thanks a ton.! Getting double view count on refresh (single.php). Don’t know if the remove action is working or not for “adjacent_posts_rel_link_wp_head”. Useless so far. I tried everything that is possible to remove double count. Using this code in a custom made plugin. Now I want the columnn in admin to be sortable. any idea how to do this? Hey, thanks for the code. Only issue I’m having is the view count is incrementing by 2 instead of 1 on refresh. Any thoughts? I have the same problem with this code. Have you found any solution of this? `add_action( ‘wp_head’, ‘track_post_views’);` in my functions.php which was also adding `set_post_views(get_the_ID());` within it. By removing the line on single.php I fixed the double count. How to show most popular posts on my home page? How do I do this for a weekly basis, most viewed posts each week?! Using w3total cache but count not working correctly. don’t use child theme. how can I fix it? I really like this option and have built it into my site. I have one question regarding the count. I found that the counts were rather high so I changed the code around a bit. With every count increase I wrote the IP address to a log file. I found hat two-third of the counts were legit and the other ones came from googlebot, apple, etc. and just now apews Is there any way to get the counts right and do you know if the ‘regular’ plugins have found a way around this? BTW: Keep up the good work, I thoroughly enjoy this site! Thanks so much. I will definitely look into that. In the mean time I implemneted the solution which was implemented in the WordPress Popular Posts plugin. That works for now, but the solution you recommended seems more future-proof. Thanks again! Hello, I am using WP Super Cache. I do not know how this code works correctly. It is not working for Custom Post Type. Can you help me on this please..
Hi! Awesome! This code helped me a lot! Do you know how to display the posts with 0 views? I have to enter to the post page by using the url the first time, otherwise it doesn’t show. Awesome thanks this is really useful, but a question. Doesn’t it slow down the loading of the page significantly? This is very useful post, i really appreciate. Can i filter the post in category, I wanted to show the post of specific category. How can i set Features post on Mobilepress Hompage? Please give me that code. Ok this is great. For some reason, post count doesnt show numbers, not sure is it because i work on a local., but what i wanted to ask even more, is how to add so it count only in the last 7 days? Hi, How can I show the most popular posts for the current week?? Awesome Article !! Thanks. Would be better if code was explained in detail. I need advice on how r u to Load Word files to a WordPress website please. Is there an easy way? Sadly this does not work with W3 Total Cache with Page Caching enabled. Coul not get any “fragmented caching” to work either. Same here @DARKSAFKA . Not working. This works great. But I need to show popular post of a day, this code shows popular posts of all time. Is there anyway to show popular posts of a day only. This doesn’t seems to work. Is there anyone who figures out how to display the most popular posts of the lasts 7 days? and my visits counts always as two. What’s happening? Thanks. Really great instruction no need of plugin.works perfect. What table does this custom field get stored into? Is it the posts table or the postmeta? Then simply add [wpb_most_viewed] to your desired page/post and it should display your most popular posts. Hello. Huge thanks for that. Works very well in my theme. Hello, great tutorial but I have one question. After following all of the steps the template isn’t paginating. It’s only showing the default 10 posts. Should this happen or is there a way to get it to paginate? Folks, please help. Just cannot figure it out. How do I change the args to the wp-query to show the most popular posts for the last week? Or month? can I do this with comments? I dont use any comments on my site so I could use this comment count to check my most popular page without adding a comment? I’ve found a number of tuts covering this topic but none seem to spell out where the line goes. I’ve tried it inside PHP tags and it breaks the page. If i place it in the HTML it just renders as a comment when you view source and no php is generated. Thanks, this works as charm, but i didn’t get how to use it with the W3 Total Cache. Hello! How can I show the most popular posts for the current week?? Is there any possible? Thanks in advance. I’m using this code for months and it’s works great! That’s before I start using W3 Total cache and the code stop counting view for me. I struck at where and how do I need to put the mfunc code. Can you point that out for me? FYI, I put all of the codes in site-specific plugin. I’ve using this code for months and it’s work greats! That’s until I start using W3 Total Cache and this code stop count views for me. I’m struck at where do I need to put the mfunc to let the code work with cache. Can you point that out? FYI, I put all the code in a site-specific plugin. Hell this is great! How would I display the view count outside of the post loop like in the sidebar? thanks for this nice tutorial. It works on my page! – how can I exclude robots and spiders that hit my posts? – May be I can set a timer of 10 seconds. after that the count should rise. So the people who only click thourgh the posts are not counted. You have no idea how much time you saved me. Thank you, works perfectly! Thanks for the tip. Will use. Hello – thanks so much for this! I noticed the question regarding the W3TC workaround, but have a slightly different question: does that still apply if I’m hooking into wp_head from functions.php, and if so, how exactly do I implement it there? Thank you! this is really easy and very helpful! thanks man!